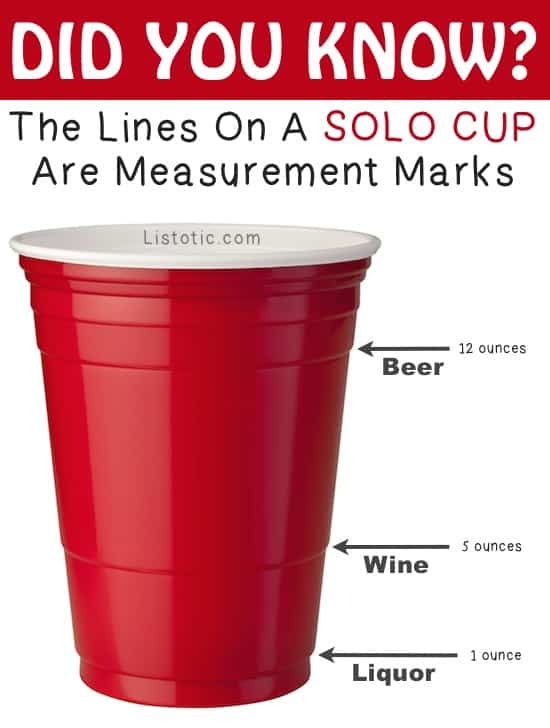 You are here: Home / Infopics / What do the lines on a Solo Cup Mean? Although this famous cup company will deny the measurement marks on their SOLO Cup (afraid of encouraging binge drinking? ), the lines on their cups are pretty darn accurate for these three common alcoholic drinks: beer, wine, and liquor. Technically, I think a serving of liquor is 1.5 ounces, but close enough! You can see where they have made some other suggestions on their Facebook page, like the 1 ounce line being best used for the perfect chocolate ratio in your chocolate milk. Good idea, too! Either way, these measurement marks have been proven accurate, so use them however you please! Perhaps I should stop filling mine with wine to the 12 ounce mark.